“‘I promise I won’t hurt you,’ you said. 16-year old Gemma is on a trip with her parents, when she is drugged and kidnapped from the Bangkok airport. She awakes later, in a cabin in the middle of the Australian wilderness. She and Ty, her twenty-something captor, are the only people for hundreds of miles. He doesn’t harm her; that’s not what this book is about. Instead, he slowly works to erode her defenses, hoping that she will come around and accept her situation with time. During the course of the novel, it unfolds that he had actually been watching her for years, and made elaborate preparations to abduct her. Of course, this is deeply disturbing, but, with time and Ty’s bizarrely kind and sympathetic character, Gemma develops some very complicated feelings for Ty. I can’t give away the ending, but I will say that I was certainly very engaged in the book. I finished it in a single night, almost rushing to find out what happens in the end. There are parts of the story that are terribly sad, as well as disturbing, and I think that’s the effect the author intended. In the end, the reader feels just as conflicted about Gemma’s situation as Gemma does herself. The mix of emotions she describes when she talks about the savage beauty of the desert, or how she feels about Ty, is really a testament to the mutability of human relationships and the effects of trauma. This book received several awards; the most notable is that it was recently chosen as a Printz Honor book selection. 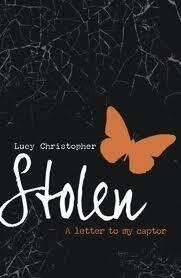 The author, Lucy Christopher, wrote the story as part of her graduate program. According to the book jacket, she was born in Wales (Gemma is from London), and grew up in Australia. The connections that Ms. Christopher has to Australia are apparent in the novel, and I liked that a lot. All in all, it’s a very original concept and setting; certainly worth a look. Christopher, Lucy. Stolen. Scholastic, New York: 2010. 299 pages. Ages 16 and up. Posted on April 6, 2011 April 6, 2011 by ShannaPosted in Printz Honor BookTagged Australia, female protagonist, kidnapping, London, Stockholm syndrome.